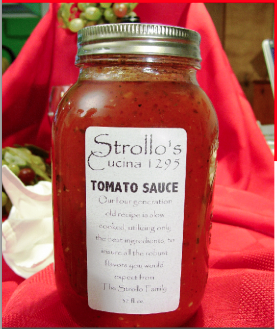 It’s been 14 years since Lakeland’s Strollo’s Cucina closed its doors, but owner Patty Strollo is back in action, dishing up her signature tomato sauce and other specialties. She can be found at the Downtown Farmers Curb Market selling jars of sauce and frozen manicotti and meatballs. Biscottis too! Call to order! We also have gift baskets for the holidays. How long have you been in business? I have been at the market since November 2009. How did you get started? I closed Strollo’s Restaurant, and the Market gave me the opportunity to see customers and keep the Strollo name out there. What kind of products do you offer? I offer wonderful tomato sauce and a variety of delicious biscotti. I also offer deliveries to customers. Personally, what’s your favorite product? I like them all. What’s one thing that your customers might not know about you personally? That my grandfather introduced spaghetti and pizza to Lakeland, FL in 1948. What’s the best part about being at the Market? The customers. What is one thing that you plan to do in the future–in other words, what are your goals for your business? To continue to provide quality products and service to customers.